Disclaimer: I was invited to dine at McFuzzlebutt’s Manchen with my fellow blogger Joanne from whatsonthelist.net and SA local business owners and winemakers. As usual, all opinions are my own. 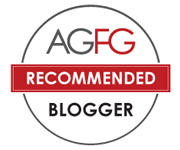 A couple of months back when I published one of my guest bloggers, Dougal’s recipes. they received high popularity. Dougal and I had good collaborations online and I am very glad to see his blog and facebook has developed a lot since then. Both of us are enthusiastic in promoting cooking with South Australian produce and we do our best to bring public attention on this issue. Many people may not notice that South Australia has indeed some of the best food produce and wines in the world because of our good climate and soil. Now onto the topic. 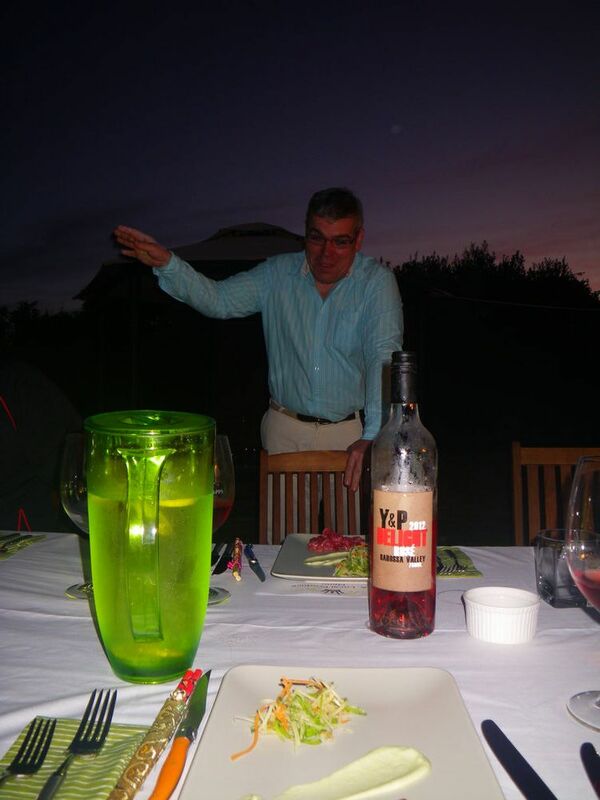 McFuzzlebutt’s Manchen organised a SA produce and blogger dinner earlier in October. 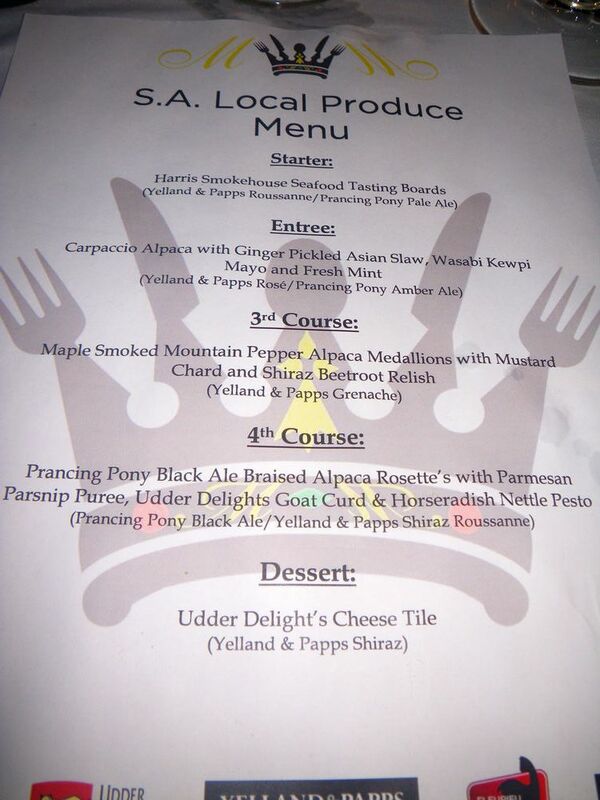 I was invited as a guest and finally can taste Dougal’s culinary creations as well as meeting the business owners from Fleurieu Prime, Udder delights, Prancy Pony Brewery and Yelland & Papp. The theme of the dinner was “alpaca dinning” and this is a meat that I have been wanting to try for a long time. You may wonder how alpaca tasted like and I can tell you in advance. It was amazing! So, if you are interested in alpaca meat, read on and I will show you the fantasies about it. To best accommodate all the delicate alpaca dishes that Dougal created, he designed a special menu that worked perfectly on the night. The wine and beer matching with the alpaca dishes was something I really enjoyed while dinning there. 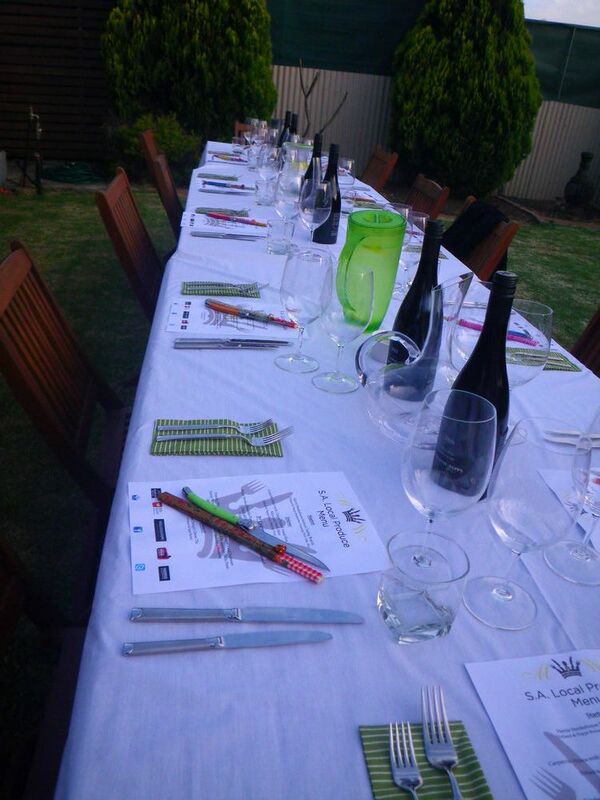 When arrived at 6 pm, the table was set up very professionally. Thanks Dougal for your invitation and catering! 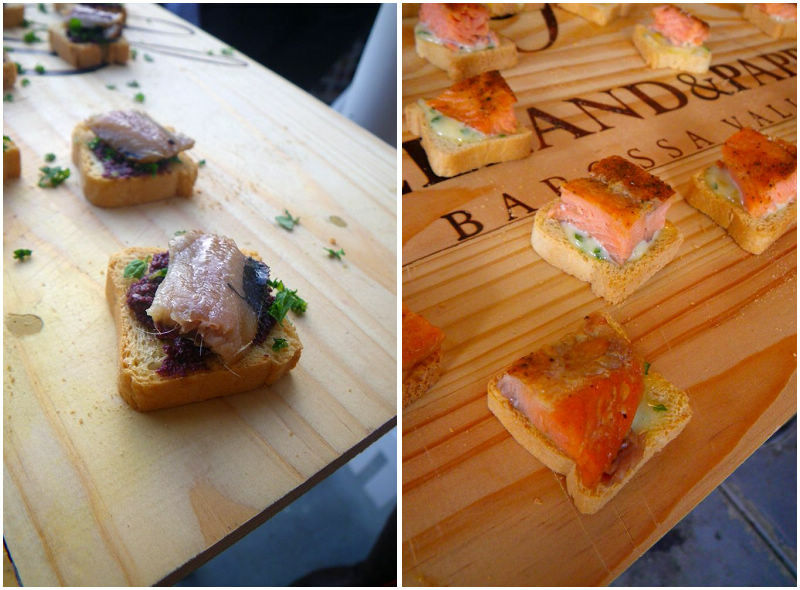 The starters for the night were two tasting boards, featuring products from Harris Smokehouse. Harris is a 4th generation, family owned smokehouse based in Adelaide Hills, using mainly fresh local South Australian produce. They now have a shop in Hahndorf and their products can also be found in Foodland. I am a regular for their smoked salmon. What’s a better way to eat sardines? These cold smoked little gems tasted brilliant. With the slight smokiness and balanced saltiness, the sardines were full of flavours too. After pan frying, the fish has been brought to a completely new level. The ‘cooked’ sardines exhibit characters of a good starter to fully stimulate my appetite. The lemon myrtle used in this dish introduced some citrus acidity and is a good source for antioxidant. Normally a hot smoked fish like salmon and ocean trout would go a bit flaky , but this fish didn’t. After biting, all the cooked fleshes all stayed together and the flavours included some smokiness with a hint of woody and heaps of fishy flavour. The cumquat and chive mayo did not only added the creaminess but also a small amount of fruity bitterness, which complemented the fish very well. Well done! 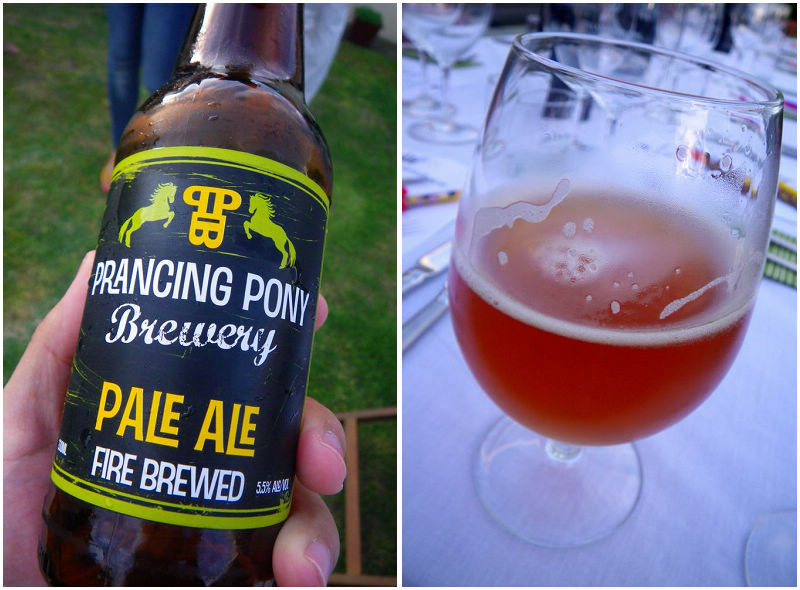 All the dishes were either paired with Prancing Pony ales or Yelland & Papps wines. 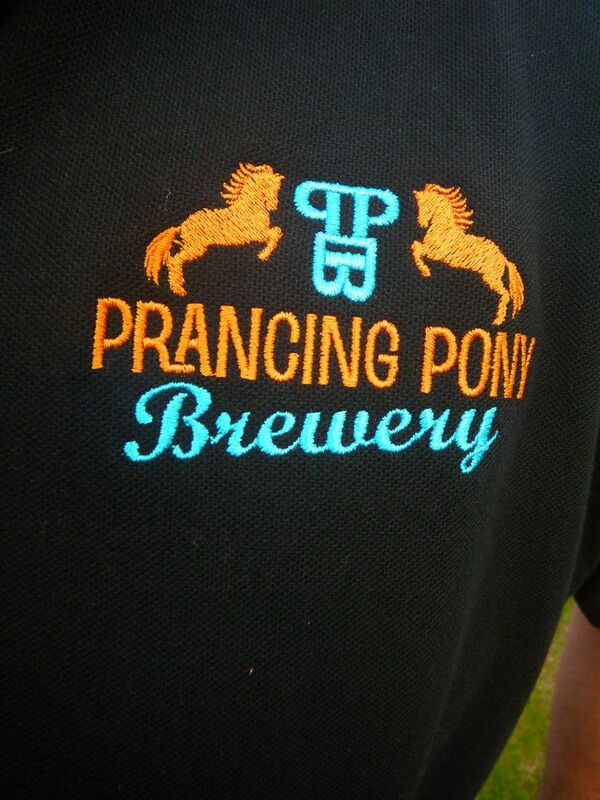 Prancing Pony Brewery is a craft beer brewery located in Mt Barker. Unlike many others, this brewery uses open flame to fire brew and the end results, ie, the ales, are very impressive. Strong barley tastes can be expected while the fruity characters still remain in the ale. Weren’t we here for the alpaca meat? Yes, they are coming. While waiting for our entrees to be served, the owner of Fleurieu Prime Alpaca, Perry, gave a brief intro about the alpaca meat and fleece industry in Australia as well as their goals and the current availability of alpaca in market in Adelaide. Alpacas, although a relatively new species in Aussie farms, have been domesticated for over 6000 years in South America. While being mainly valued for their fleece, alpaca meat has now attracted many attentions as they are lean and flavourful. Simon Bryant, my favorite celebrity chef in Adelaide, has created dishes using alpaca before too. The entree for the night was Capaccio alpaca with ginger pickled Asian slaw, Wasabi kewpi mayo and fresh mint. I tell you this. You won’t believe it! The raw alpaca meat tasted exactly like a combination of blue fin tuna toro (belly) and veal! On the texture, the alpaca and the tuna belly were similar to each other and biting a piece of the alpaca gave plenty of the oil feeling in the mouth. Strangely. this meat was very lean! On palate, the alpaca meat was very clean with no other odour. Lamb and beef are not where near alpaca. 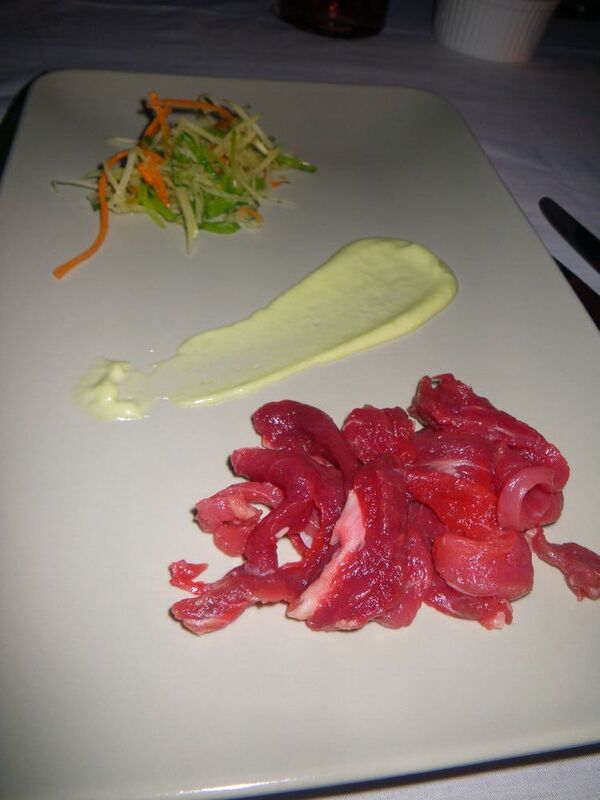 Although being similar to veal in taste, the alpaca tasted much better than our normal meat! This dish was beautifully created as all taste were balanced out. I especially liked the ginger pickled Asian slaw which added a touch of bitterness to enhance more of the alpaca flavour. Well done! This dish was paired with Yelland & Papp Rose 2012. 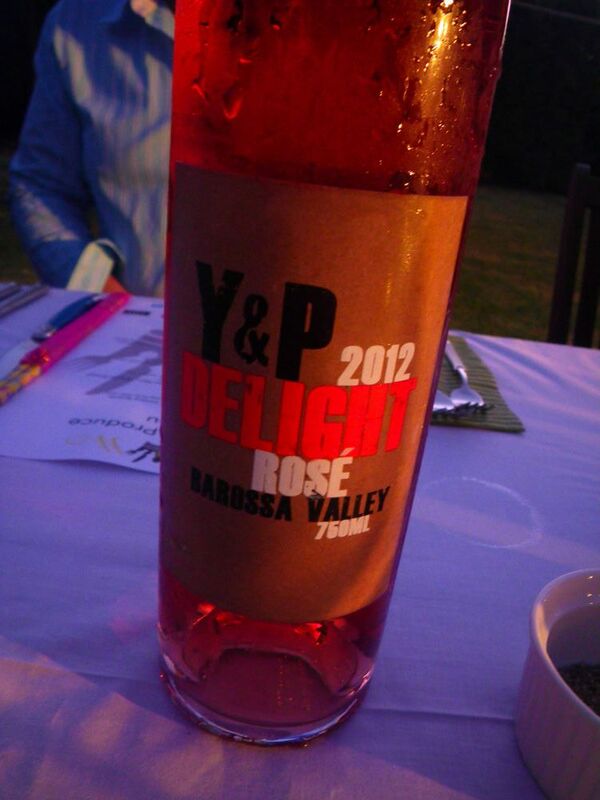 Y & P is a FIRST generation winery located in the world famous wine producing region of South Australia, Barossa Valley. However, the quality of all their wines are even better than some of the old wineries. Being awarded a 5 star winery by James Halliday for 6 years from 2009, Y & P is also awarded the best small cellar door Barossa Valley by Gourmet Traveller 2013. When Dougal told me about the pair of carpaccio with a rose, I was actually concerned, but after tasting it, I knew straight away that he was absolutely right. This rose exhibited strawberry and cream character on the palate and in fact the creaminess was quite strong at the back of the tongue. With a great length staying in the mouth, these two flavours helped to digest the alpaca meat better and always left my mouth wanting to chew more of the meat. Although the wine had some sweetness, it was partially balanced with the hint of acidity in the wine. In fact, it was a quite surprise find for me because it tasted much much better than some “several generations” winery. I absolutely love this wine! The third course was smoked alpaca. Dougal’s smoker has done a fantastic job. 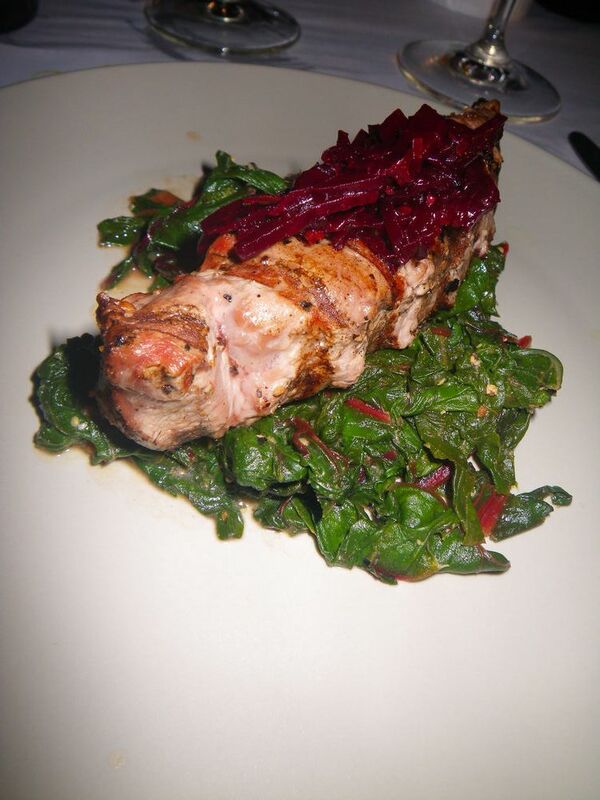 In fact, after smoking the meat was even more like tuna, from the color to the tenderness and the taste! Dougal is an expert in playing with Aussie native plants; the use of mountain pepper is a good one here. Although no salt was used in this dish, the meat tasted brilliant and was tender, moist and flavourful. The addition of shiraz beetroot relish is an intelligent behavior as it lightened the meat with some bitterness and sweetness, which promoted the flavours even further! Now this is something really amazing! 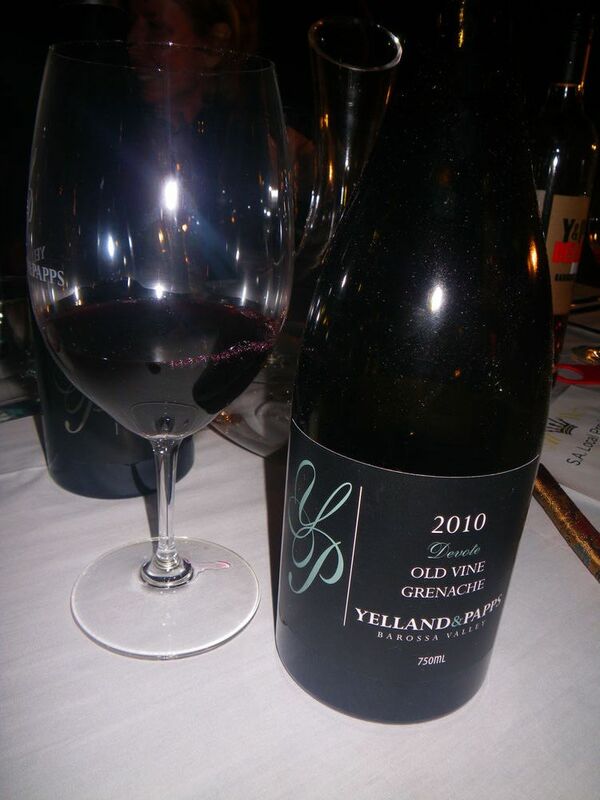 The wine pairing for this dish was chosen to be Yelland & Papp Devote old vine Grenache 2010, a wine with strong intensity of strawberry, cherry and raspberry and moderate amount of milk chocolate with hints of spices. All these complemented the red meat very well. The alpaca neck was slow cooked over night and I should thanks Dougal for all these efforts for putting in the preparation of the dishes. The meat was cooked to perfection; light, fluffy and went down my throat easily with the jus. The black ale flavours has fully diffused into the meat and made every bite an interesting one. The use of nettle pesto was a successful trial because once combined with horseradish, the pesto showed bitterness and would neutralize the bitterness of the jus. Strangely two bitter tastes cancelled each other out! The meat in this case tasted like braised veal and the meat’s texture was close to a gravy beef cooked by pressure cooker. Nice! At this stage, I was super full but wait a minute, there was a cheese tile which supposed to come :D! 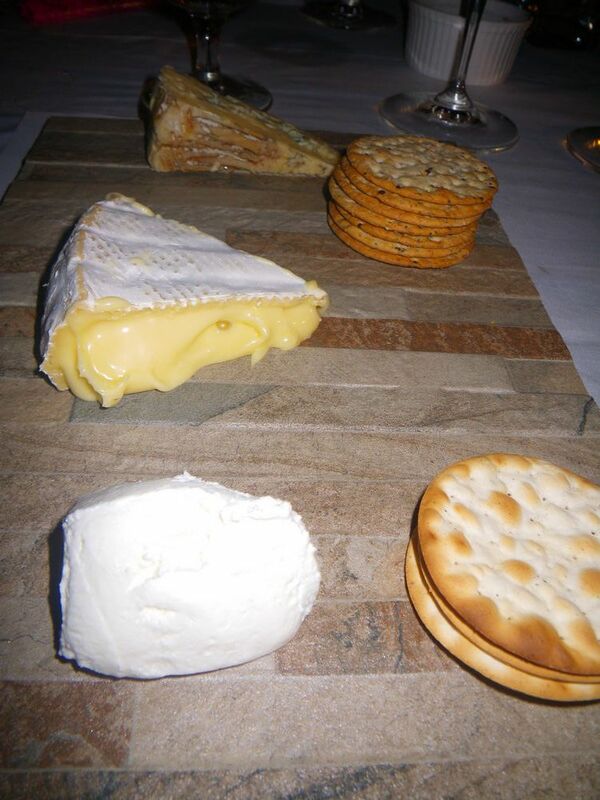 In speaking about cheese, Udder Delights in Adelaide needs no introduction. This family owned and operated business is located in Adelaide hills and has a cheese cellar on the main road in Hahndorf. On the night, I met Sheere, the educator of Udder Delights and I could tell, from the time she started talking, that she’s so knowledgeable and passionate about cheese and its industry. Their products are now available across the states in Australia. The Udder Delight cheese cellar is also the start point for Adelaide Hills cheese and wine trial. Thanks Dougal again for his invitation and thanks the sponsors of the dinner as I’ve met with some amazing people and found some amazing hidden food gem in Adelaide. McFuzzleButt’s Manchen is now a registered business and if you want to experience Dougal’s cooking talent like I did, he is now doing cooking demonstration in Harris Scarfe in Rundle Place in the city every Friday at 12pm and 6pm. Catch him and see him in action with some fantastic South Australian produce! Looks amazing mate! Where can you get the alpaca meat? I think you can get it from Feast fine foods in Adelaide central market now. What a fantastic night you’ve had! 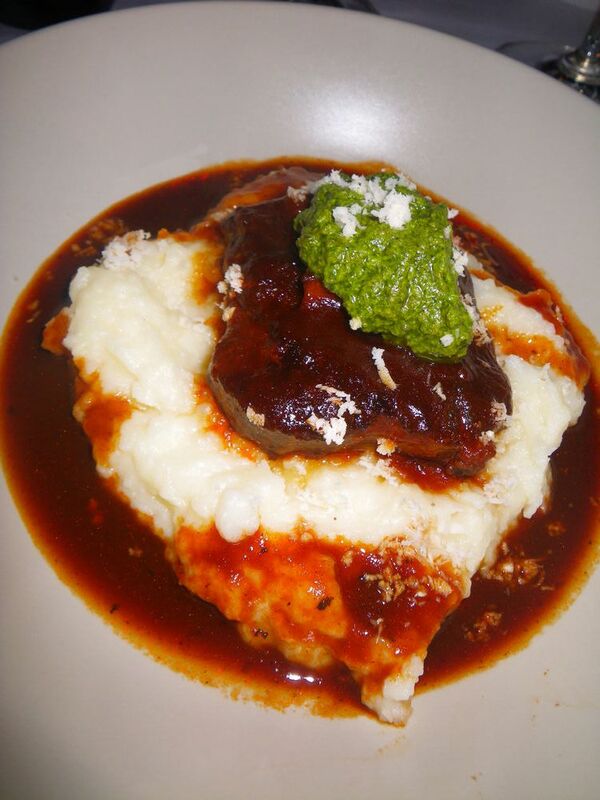 These dishes are mouth watering and could not wait to read your own recipe on alpaca. Stay tuned. I’ll publish mine in a couple of weeks. Before every ‘s’ ? The only apostrophes that I saw used were in ‘McFuzzlebutt’s Manchen’ – which clearly refers to the Manchen of McFuzzlebut, and therefore correctly used. If you wanted to be picky you should have spotted the double ‘n’ in dining. G’day and great write up Xin! Was a terrific night hosted by Dougal and loved the interaction with the SA producers who are PASSIONATE about their food and wines (beer) too! So do I. Really enjoyed the night and the food. The owners are very passionate about their food. This means in SA we get nice food too. Great write up Xin. Thank you for the feedback, I had a fantastic night creating these dishes from the produce supplied and spending time with the people behind it.